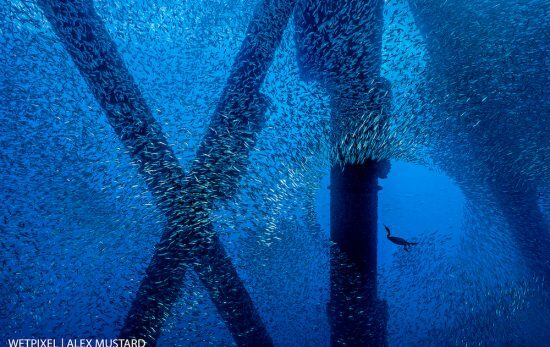 Firstly, let us know a little bit about you; where do you normally dive and how long have you been diving? 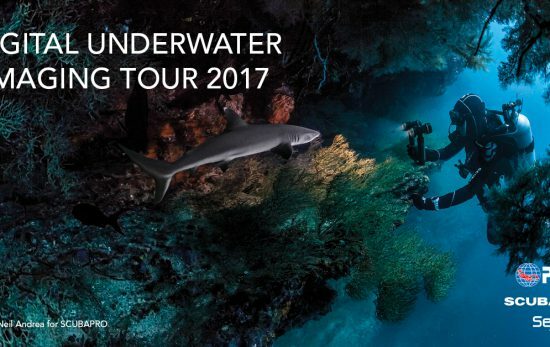 I am Des Glover, I’m 47 years old and have been diving since 2000, and teaching since 2003. 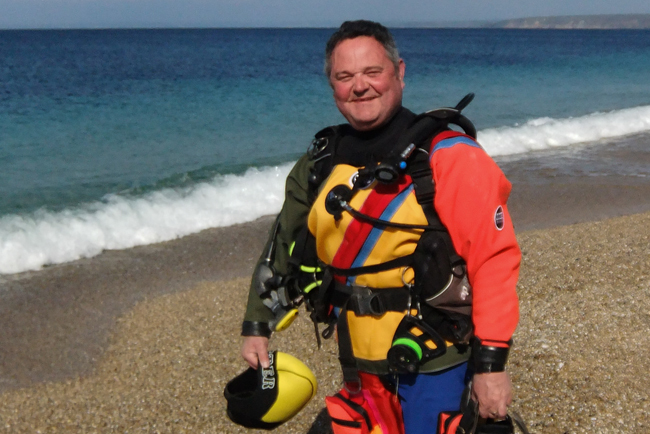 As the co/owner of Kennack Diving, all my diving takes place around The Lizard Peninsula in Cornwall where we are surrounded by beautiful scenery, stunning underwater wildlife and dive sites. Kennack Diving is a PADI® 5 star dive resort and as such we teach a full range of PADI courses. We also work with English Heritage on some protected wreck sites around the area. 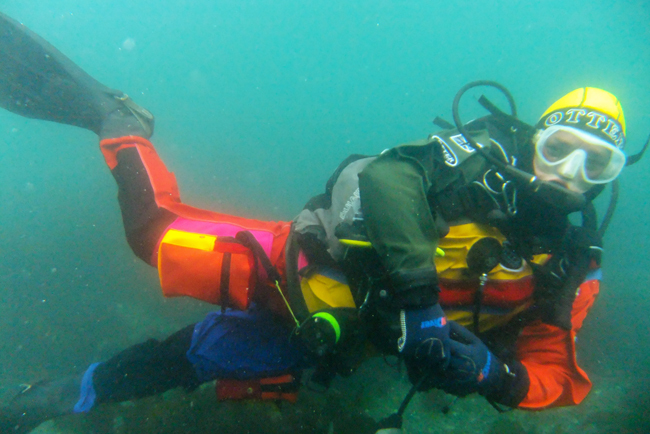 What was it that inspired you to create a ‘technicolour drysuit’? Whilst diving and teaching I realised that the majority of divers seem to favour black as the main colour of their dive kit and I began to wonder why. During all courses safety is at the forefront of everything we do, so why shouldn’t this apply to colour of kit? Surely being seen more easily can only be a good thing; for your buddy, for other divers and definitely for the emergency services, in the event they are ever needed. So I asked myself why not wear something brighter ? A bright hood, BCD and even coloured fins would help, but I wanted to make a statement to promote my idea. I decided it was time for a new dry suit! How do you go about getting a suit like that made? I contacted my good friends at Otter Dry Suits and ran my idea past them to see if they could help. I asked them to make me a suit but change the colour of every panel to make it a suit of many colours! The brighter the colours the better and the more variety of colours would also help this to be a very special dry suit to attract a lot of attention and get the message across. This is what they came up with and I could not be happier with it! What advantages do you think there are for your suit against the traditional black and dark coloured suits? The advantages of a suit like this are endless. First and foremost is safety! As an instructor I want to make sure my students can see me and recognise me very easily. As a dive buddy I want to be visible to my buddy, and in the event that something happens, I want to give the emergency services the best chance of finding me. Black suits and kit are great but in poor visibility they are hard to see. Some divers say that they wear black to get closer to wildlife and if they were more colourful they would not be able to do so. However, I always think, if this is the case why do anglers put coloured beads on their lines to attract fish? Having used this suit for a while now I can tell you this is not the case and I would say a lot of wildlife are attracted by the colour and not scared off by it . I don’t expect everyone to buy a suit like this, or even like it (however the vast majority of people I’ve met love it!) but by just wearing it other divers always ask me about it. This enables me to promote being seen and hopefully encourage them to wear something bright. If this article has inspired you, why not look into doing the PADI Drysuit Diver specialty?